If you are counting sheep all night, you're not alone. The inability to sleep well afflicts many of us and saps our ability to fully enjoy and participate in life. In many cases, our lives are simply too busy for us to get the number of hours we really need. 4Life® SleepRite is a tremendous formula designed to promote restful and rejuvenating sleep. It combines melatonin, a proven alternative to naturally aid sleep, with 5-Hydroxytryptophan, vitamin B6 and a remarkable proprietary blend of herbs, to provide you with a complete and highly effective supplement that contributes to improved sleep patterns and overall health. 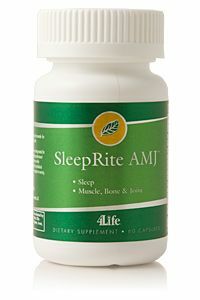 SleepRite AMJ is a proprietary blend of natural ingredients for a restful night sleep and supplies important nutrients that support healthy muscles, bones, and joints. It combines melatonin, a proven alternative to naturally aid sleep, with 5-Hydroxytryptophan, vitamin B6, and a proprietary blend of herbs to help support healthy sleep patterns to help your body function at its best.